For my first documented birding trip, I stayed in a cozy cabin at Stub Stewart State Park, 34 miles west of Portland. This woodsy park made for a perfect birding opportunity. 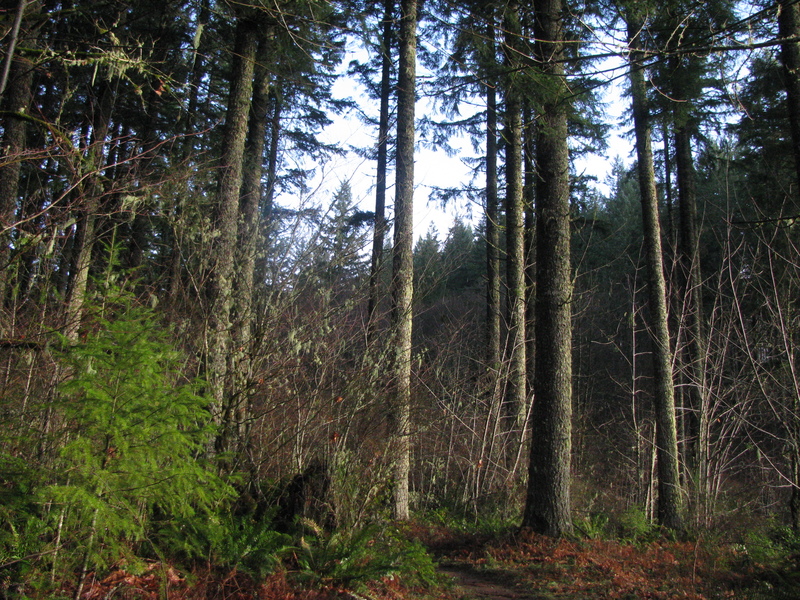 The forest is mainly comprised of tall, even-aged Douglas-fir with an under-brush of ferns and (seasonally) leafless vine-maples. I took several lovely walks in the mornings and evenings over three days. The temps were in the 40s and the sky was sprinkling on and off and the last day was pretty foggy. The best (most species) birding day was December 25th (Christmas day!). For simplicity’s sake (and because I’m still learning how to journal usefully) I’ll combine sightings. Grey Jay (Perisoreus canadensis) – Several near cabins and picnic tables. In groups, boldly approached cabin and camping gear scavenging for food. Saw one catch a few grubs early one morning. Stellar’s Jay (Cyanocitta stelleri) – At least four seen along with various other birds (song sparrows, varied thrush, juncos) in the grass scavenging through leaves. Hairy Woodpecker (Picoides villosus) – Sighted pecking on narrow (Red alder?) tree trunks, surprisingly low to the ground (yay photo op!) Wasn’t sure if it was a Hairy or a Downy woodpecker since I know they are almost identical, but because of the longer bill (about the length of its head) I’m pretty confident it’s a Hairy Woodpecker. Downy woodpecker bills are shorter than the head. Believe it to be female since I didn’t see any red coloring on its head. Chirping and active, also accompanied by a few varied thrushes at that time. Northern Flicker (Colaptes auratus) – At least three seen foraging in the grass and leaves on the ground near the cabins. Accompanied by sparrows, jays, juncos. Flew to nearby tree when people walked by. Red-breasted Sapsucker (Sphyrapicus ruber) – Three seen, one very close to our cabin that remained pecking at a Douglas-fir tree for hours each day we were there. 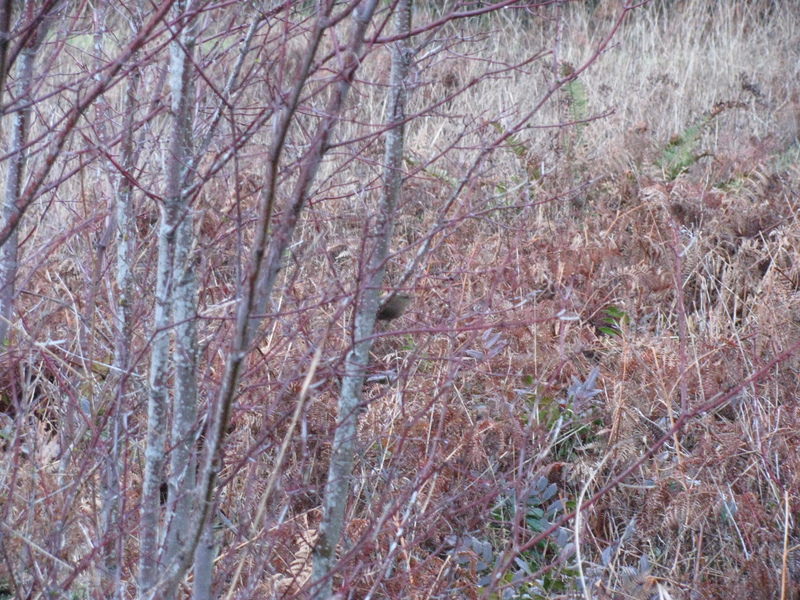 Another visible lower on a thin (red alder?) trunk hard at work creating (what I later learned at Audobon) “sap wells” that attract insects the bird will later come back and eat. I saw a third red-breasted sapsucker high up on a Douglas-fir tree on another hike. Dark-eyed Junco (Junco hyemalis), subspecies Oregon Junco (Junco hyemalis oreganus) – Several visible foraging in the grass, and hopping near the parking lot area. Song Sparrow (Melospiza melodia) – Foraging on the ground (in grass and leaves, ran across trail) near the cabin trails with juncos, Stellar’s jay, Northern flicker. Northern Pygmy Owl (Glaucidium gnoma) – My favorite sighting! Who doesn’t love an angry owl? (the red-breasted sapsucker sighting came in a close second). Owls are fascinating and I felt lucky (and surprised) to spot one. It was perched atop a youngish Douglas-fir tree near a meadow seen on an early evening walk near sunset on Christmas day (what a great present!). Red-tailed hawk (?) (Buteo jamaicensis) – Seen high above perched on a tall Douglas-fir near the horse staging area at the park. Minutes later it flew across a meadow and perched on a scrawny, but still tall tree. Based on the streaked “belly-band” and pale breast color I’m moderately confident it was a red-tailed hawk. (I still have much to learn on raptor identification). Ruby-crowned Kinglet (Regulus satrapa) – While I was kneeling on the ground taking pictures of the red-breasted sapsucker this little bird flew onto the bush right in front of me – what a treat! I’m pretty sure it’s a kinglet due to the olive color and uneven white eye-ring, though I was unable to see any red crown patch (could be female?). Varied thrush (Ixoreus naevius) – I saw many (at least five?) of these beautiful birds. To my inexperienced birder eyes, at first I thought they were orioles (Bullock’s oriole) due to the orange and black coloring, but after doing some quick research in Cornell Lab of Ornithology’s Merlin Bird ID app, I realized it was instead the varied thrush. They were at or near the forest floor (hopping from tree to tree), picking in the grass and sending out alarms when I walked by. Chestnut-backed Chickadees – Through my binoculars I gazed high in the Douglas-fir to see a flock of chestnut-backed chickadees and found these birds to be the chittery-chatty birds I heard throughout the woods (but had a hard time finding/identifying). Very quick and active. Mystery Bird: This little brown bird (or should I call it a LBJ- Little Brown Job?) flashed by and I couldn’t get a good look at it. Possibly a wren of some sort? My best guess would be a winter wren (Troglodytes troglodytes, Family: Troglodytidae) based on the sort of short pale or indistinct “eye brow” and dark brown-ish belly. Also, the call to me sounded like “pip pip” but it could actually be what the guide books describe as a dry, low “chimp chimp” or “chat chat.” I didn’t get a good look at the tail to tell if it was in the (wren’s typical) raised vertical position. It’s possible it could be a bushtit, I think I heard some in the vicinity and the size fits, however the belly looks possibly too dark. And the “pip pip” call doesn’t match so I’m sticking with my original best guess of a wren. 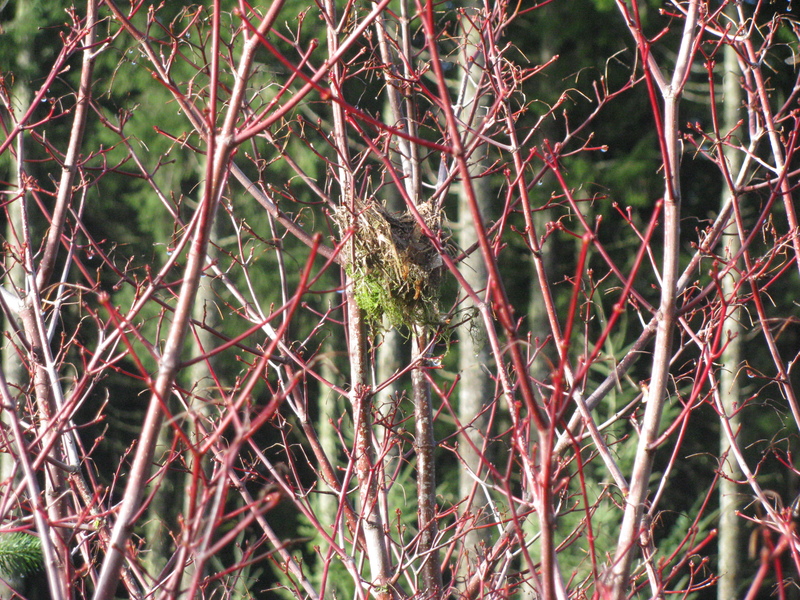 Nest – I happened to notice a nest near the trail, low in a shrub. I wonder what little bird (s) made it! What did I learn from my first birding post? It took a long time to write out the family/species/sightings. In future posts, I may list the species seen/heard, and only include a few unique or noteworthy sightings. I might make a “chirp confidence rating meter” – a visual to describe how confident I am with my sightings. 5 chirps is a positive ID, 1 chirp, not so much. I’d like to create a “check-list post” of Oregon’s Birds to keep track of sightings. I have a Latin for Bird Lovers book that I’ll use to include a bit about the origin of the bird’s names. I’m excited for my next trip! Hi! My name is Audrey. I’m 34 years old, I live in Portland, Oregon, and I am a new birder. I have a passion for nature, learning, and anything outdoors. I’ve decided to spend a year learning more about my feathered friends. Why pick birds? Simple, they’re everywhere, they’re entertaining, and they have a raw beauty; sometimes cute, sometimes aggressive, but always natural and real. It’ll give me an enjoyable focus on my hikes and more reason to go outside (especially in the winter). It’s not always easy to identify or find birds; it will be fun discovering new (to me) species and understanding more about bird behavior. Nature: Not that I need much forcing, but birding will be a good motivator to go out into nature regularly. I hope to spend one day a week checking out a new location. Awareness: Birding slows me down, which is a good thing! While hiking, I think it’s good practice to stop, listen, and observe my surroundings. I might notice something that I would otherwise miss. Education: I’m excited to learn about, witness, and observe new species. I’m reading several guide books and trying out new (to me) identification apps. Patience and the art of letting go: I’ve already noticed challenges; a bird will whiz by or I’ll hear unidentifiable (to me) song notes and my temptation is to tromp off into the wilderness and chase after the little mystery. But instead of going down the rabbit hole, my aim is to follow the Code of Birding Ethics from the American Birding Association. Pictures! I love taking nature photos (not just of birds! ), and hope to upgrade my camera soon. I’ve taken an Ornithology class many years ago, and have done some casual birding along the way, but I’d like to give it a go for a year and document my findings. I’m a member of the Audobon Society of Portland and have also signed up for a beginner’s birding class in February. I’m an opportunistic birder, I don’t have any solid plans outside of the state thus far, but I’ll mostly focus my efforts on the (gloriously bird-rich) state of Oregon. With hundreds of species of birds to find, and spring on the horizon, I’m excited to get started!